A cultivar of Prunus avium L. ‘Large, obtuse heart-shaped; surface irregular and uneven. Skin deep black. Stalk an inch and a half long. Flesh purplish, juicy, half tender, and rich. Stone small, roundish oval. Succeeds well against a wall, when it is ready by the end of June.’ [Hogg – Fruit Manual p.51/1860]. ‘This Cherry is generally considered to have been brought into this country by the late Mr. John Fraser, from Russia. In the account given of it in the Pomona Londinensis, it is stated to have been introduced from Circassia, by Mr. Hugh Ronalds, of Brentford, in 1794. We have also heard it said that it originated in Spain, whence it was transmitted to the Russian Gardens, and through them into England.’ [PM t.44/1828]. A very erect tree, becoming wide spreading. A good quality mid-season or late cherry which tends to crack. [Grubb]. 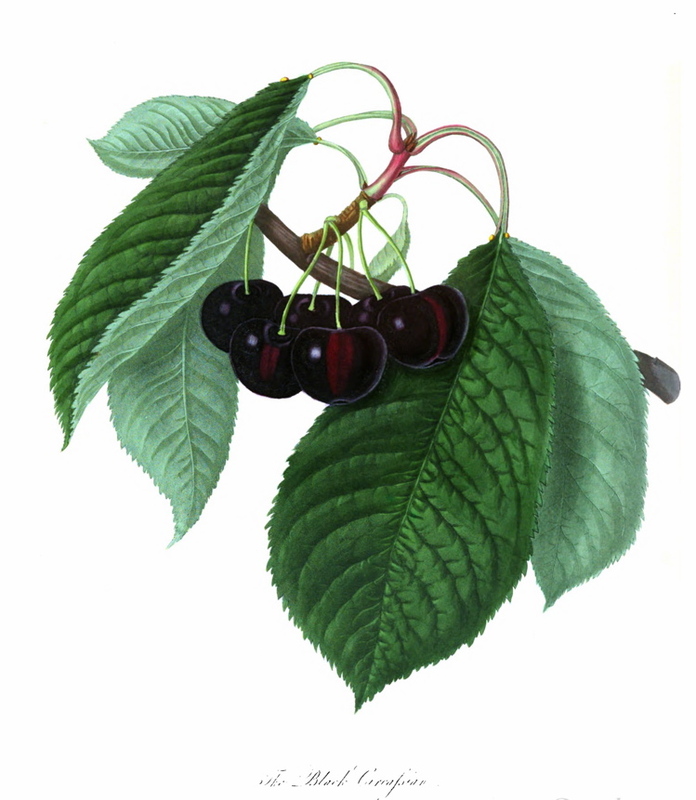 Bowman commented that the cherry grown in Australia under this name in 1937 may not be true to type. Listed in an Addendum to the 1857 catalogue only [Cherry no.21/1857].